Impromptu warm front chase across central IL. Targeted low topped mini supercells crossing I-55. Intercepted severe warned storm west of Alhambra on 55, noting rotating wall cloud and funnel. Followed new convection to the southwest noting low topped convection and lowering under base. Retargeted previously tornado warned storm as it approached Livingston, noting slender rope funnel and photogenic sunset convection. 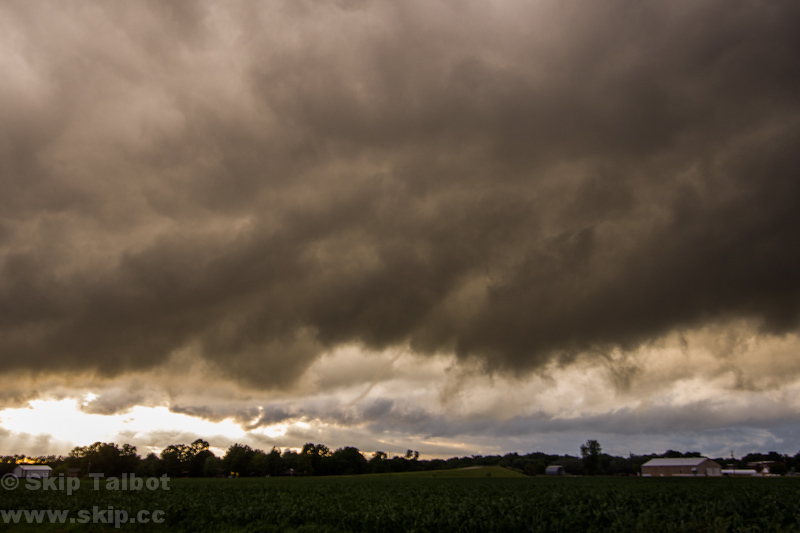 Saturday, June 7, was a day on which I awoke not expecting to be storm chasing. More subtle conditions that were not advertised on the long range weather models were coming together across central and southern IL for a potential tornado event, however. A trough was digging into the region with a warm front lifting from the south with temps climbing into the upper 70s and dewpoints in the mid 60s. Modest instability yet very favorable shear profiles suggested the potential for low topped supercells. I prepped the van for a short notice, impromptu chase. 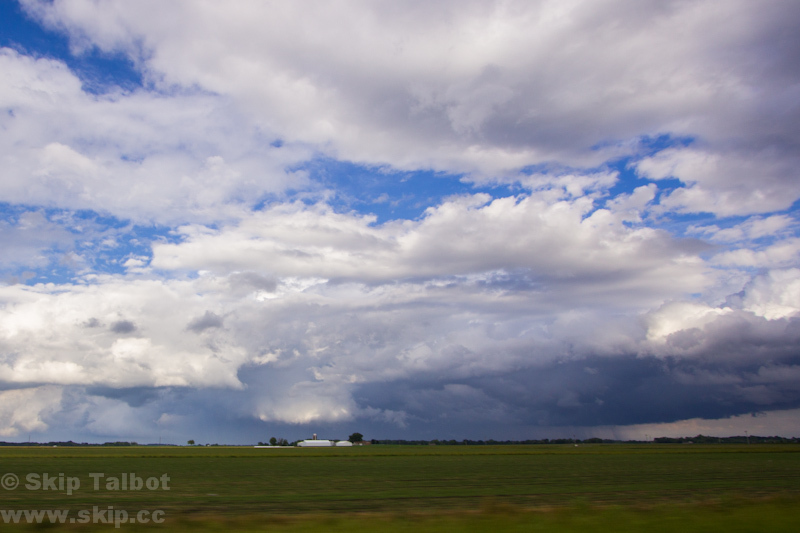 The plan was to catch some of the low topped storms as they crossed I-55 several miles south of Springfield. My expectations for the chase were low, given the rather marginal parameters the event featured, but I figured it was worth going out for some potentially photogenic storm shots. I didn't realize how potent the unfolding event was, however. Heading south down 55 there were a string of three cells starting to cross the highway, barely red blips on the radar, the southern most was severe warned. 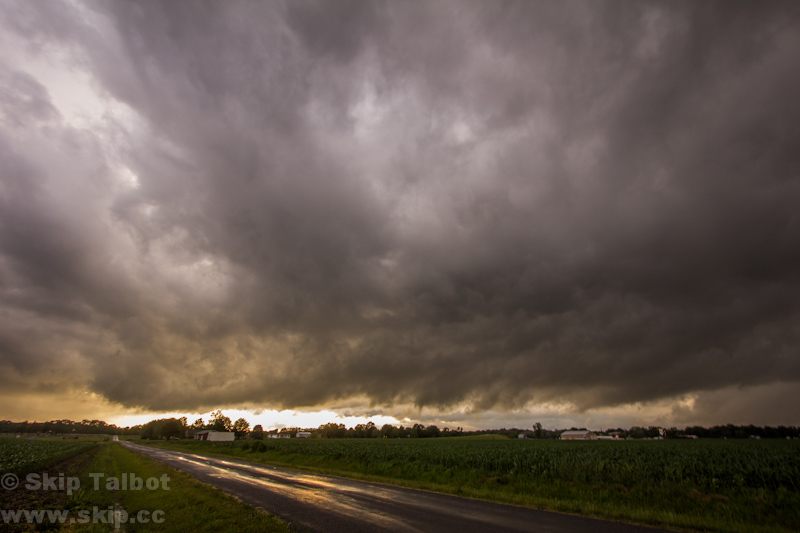 I made for the tail end storm, exiting the highway and getting into where I thought the inflow notch should be. The storm's base was practically scraping the ground in the cool, saturated air. Wind and rain rocked the van. A spotter reported a funnel cloud to my southwest by a couple miles. I couldn't quite see the base due to how low it was and some terrain obstructions. I decided to move in closer, and as I did so the storm passed in front of me with a ground scraping wall cloud crossing the interstate heading east. I followed it east from the southwest. The structure was impressive and much more than I expected given the small, globular cell the radar was depicting. A classic wall cloud with pointy tail cloud passed in front of me. The southern end twisted into a point, wrapping up in thin layers like a sheathed telescoping roll of paper. A funnel! 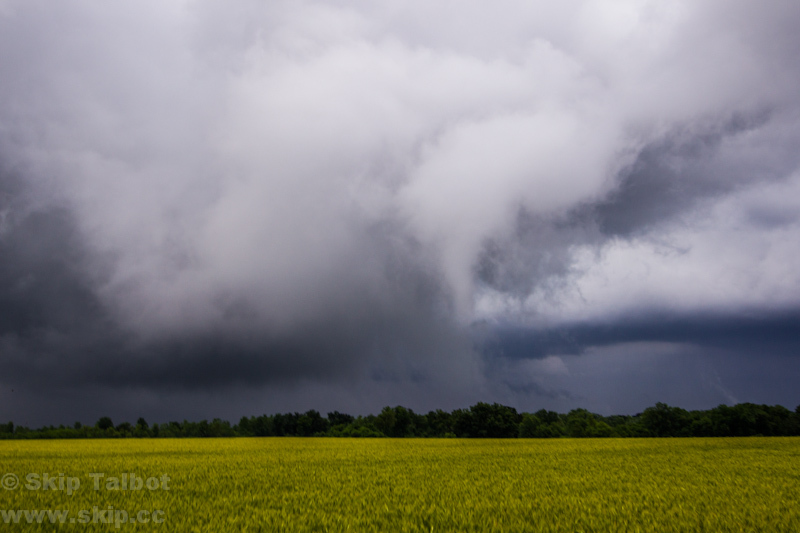 The feature didn't last long before the circulation went horizontal into more of a roll cloud. I soon realized that I was chasing low topped minisupercells capable of producing small tornadoes, not mediocre pop up thunderstorms. The arc of small cells congealed and weakened so I let it go, heading for more robust activity to the south. A series of cells were coming out of the Saint Louis area with reported tornadoes. I approached one of them near Aviston and followed it east for several miles. Approaching from the west, I could see the entire storm. The top was only a few thousand feet above the ground and so it had no anvil, but there was a distinct lowering underneath the updraft base. This tiny storm was sporting a wall cloud, lit up bright white as it caught the sun on the back end of the storm. These cells eventually weakened too. It seemed like the low instability environment did support much longevity to the mini supercells. A small storm was crossing the Mississippi well to my northwest with a tornado warning. It would take me almost an hour to get to it, so I figured it would probably dissipate, but it was on the way home and I figured I could at least get some sunset photos of dying convection. Sure enough, the warning was dropped while I was half way to the storm. I caught it near the interstate south of the town of New Douglas. A ragged gust front or flanking line came into view, lit up in fiery golden shades from the low evening sun. On radar, the tiny cell was now nothing more than a few green pixels. I watched the gust front for a couple of minutes until I realized there was something odd protuding from the clouds. It looked like a thread of some sort was dangling from the gust front. 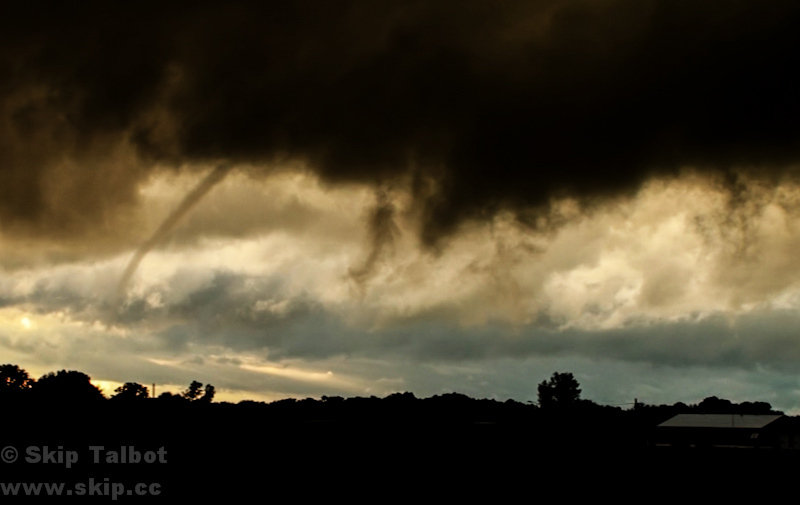 It took me several moments to realize what I was even looking at: a long skinny funnel cloud. I couldn't believe it. The storm was nothing more than a tiny blip rain shower on the radar. I dropped my still camera and grabbed the camcorder out of the dome to get a quick handheld shot of it zoomed in. The funnel lasted a couple minutes before it roped out and vanished. The funnel was tiny and almost difficult to spot from my distance but I could distinctly make out the edges, which appeared to condense all the way to the treeline, a likely tornado. Cars on the interstate were honking, no doubt in reaction to the spectacle. I logged on to Spotter Network to report the feature, but I was almost reluctant to at first. The funnel appeared to be low enough to be making ground contact so I was about ready to send in a tornado report, but who would believe it? 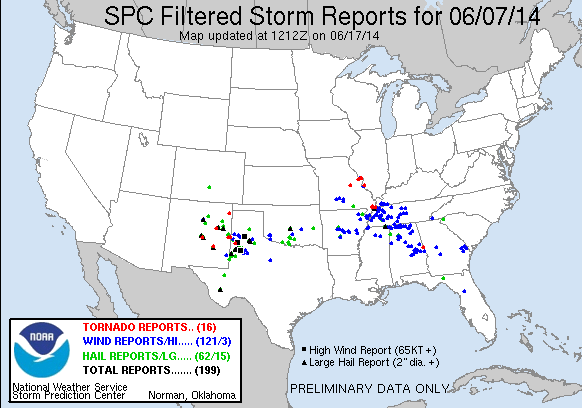 There wasn't even really a storm on the radar, and a tornado report coming out of nothing would seem ridiculous. I zoomed into my still camera's LCD screen to take a look at the funnel close up just to make sure I wasn't crazy before I hit send on the report. Envigorated by the catch I went after the tiny little cell as it tracked east. I drove right up to the spot that had produced the funnel and got out to take a look. Very warm and moist inflow surged into the updraft base before giving way to some gusty outflow from the opposite direction. I couldn't believe how the airmass had recovered as two other storms had already tracked over the same spot. The setting sun lit the bases up in pastel pinks, purples, and blues. It would have been absolutely gorgeous, perfect lighting for another funnel, but the tiny cell fizzled and got lost in a sea of ragged convection. I made for home, filled with awe and wonder. The twilight skies were beautiful. 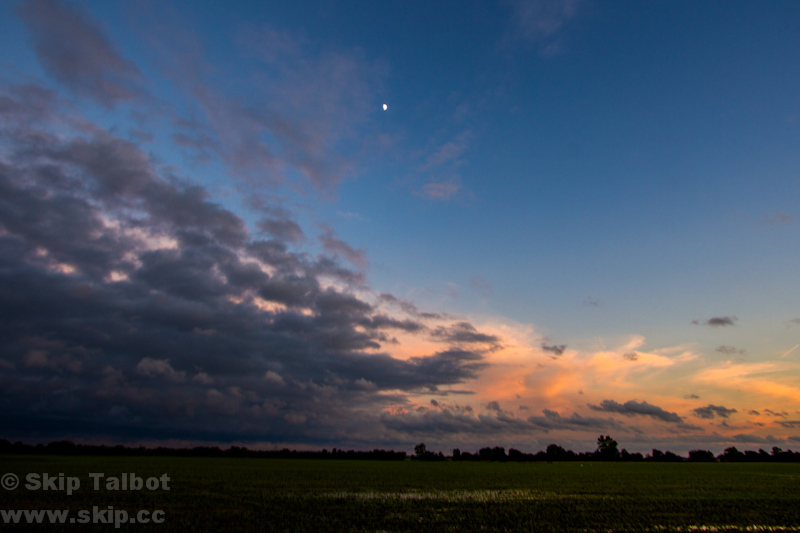 Distant storms lit up in gold and pink, low clouds in dark steely blues and purple, and the moon shining above. For an impromptu chase, this day vastly exceeded my low expectations. 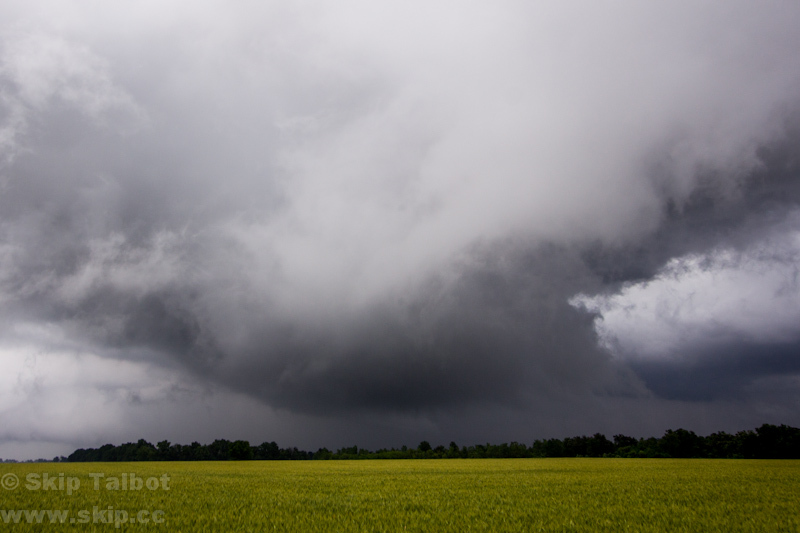 The mini supercell structure and wall clouds were great catches, as good as some small tornadoes I had witnessed. 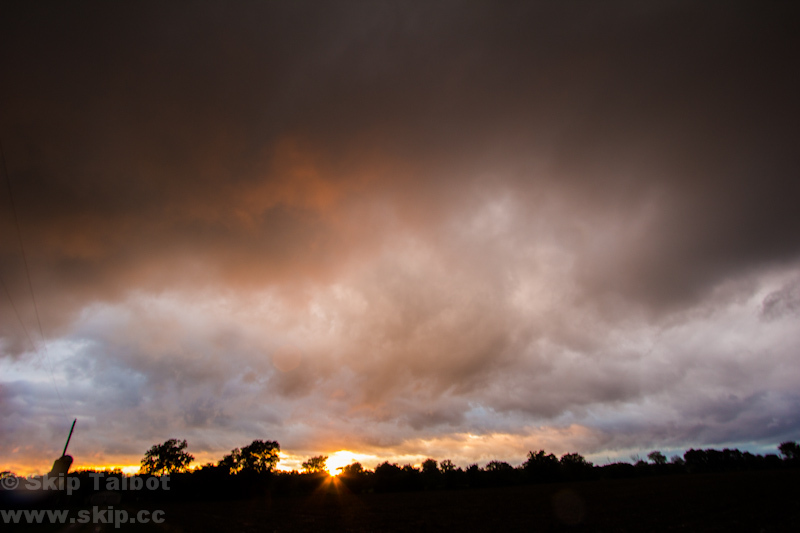 Combined with the beautiful high contrast and sunset storm shots, it was a very rewarding storm chase. Several tornadoes were produced and documented near St. Louis, mostly smaller and weaker ones without fully condensed funnels but prominent debris clouds. After some debate, I finally decided not to count my second funnel catch as a tornado even though I reported it as such. At the time, I thought the condensation funnel had extended to or below the treeline, but after reviewing my photos and videos, it looks like it stopped short a ways. I also couldn't find any sort of debris or ground level circulation although trees blocked my view at ground level. The feature was also reported by an area spotter as a funnel and not a tornado. Regardless, it was far more than I expected and I was fortunate enough to be able to witness and document the event on what would be one of my shortest distance chases of the year. It's possible for low topped, unwarned cells with less than 40 dbz radar returns to present supercell structure, wall clouds, funnels, and even small tornadoes. Double check your funnel cloud shots for ground contact before reporting tornadoes, or just leave the report as a funnel.